Like movies? Got $6,000,000 kicking around? Why not deck your house out with the most extreme home cinema room ever conceived? This chap did, and just look how happy he looks with life. Ever wondered about the tech that goes inside the pro level pig bladders? If so, prepare to be blown away: the official World Cup football is the result of a lengthy, painstaking process. We heard it's actually woven together in the Himalayas from Lionel Messi's toenails. Not-so-subtly timed to coincide with the launch of that Apple thing, US network Sprint boasted some vague stats this week that minced words eloquently enough for half the web to come away thinking the HTC Evo had outsold sliced bread. Next day those numbers turned out to've been plucked from thin air. Whether this is good news or not remains to be seen, but what we do know is that some report or other reckons that the need to absorb all the internet has to offer at all hours of the day comes form the same part of your feverish brain as the need to Tiger Woods everything in sight. If Tony Stark had his coital way with George Lucas, this would surely be the result: a much more badass, iron-clad droid in hotrod red. C3P0 would probably explode with inappropriate robotic desires. The modding community never ceases to amaze with its tireless efforts to take useful things and wrangle them into amusing uselessness. 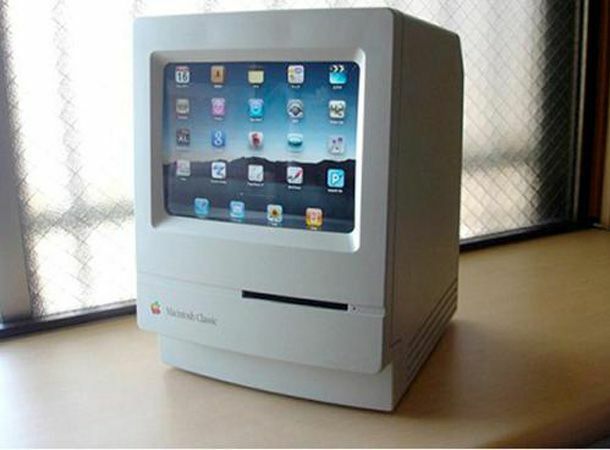 Case in point: Ram a brand new iPad into the shell of an old classic Mac computer. The reason? Irrelevent. The result: awesomeness. Google's decided to let users stick their own images up as the search engine's background, having presumably decided that the colourful images on Bing are what people want. Only problem is that the link explaining what the hell was going on didn't work, people got massively confused as to what was happening and Google had to retreat the idea after just one day. Did you enjoy playing that Pac-man Google doodle the other week? Well spare a thought for the older generation, who duly spent the day cowering in a corner from all the flashing colours and loud noises. This tech support call proves that computers really are dangerous things in the wrong hands. If you're not quite sold on the idea of 3D TV, watch all 1.42 of this video and we guarantee you'll see it in a new light. Pure advertising genius at large. Meanwhile... we had an interesting delivery from Orange yesterday. Coined the "Shady", it's a visor for your mobile phone to allow you to watch the World Cup on your handset without those perky rays of sunshine. Although it'd probably come in handier keeping the rain out, all things considered.